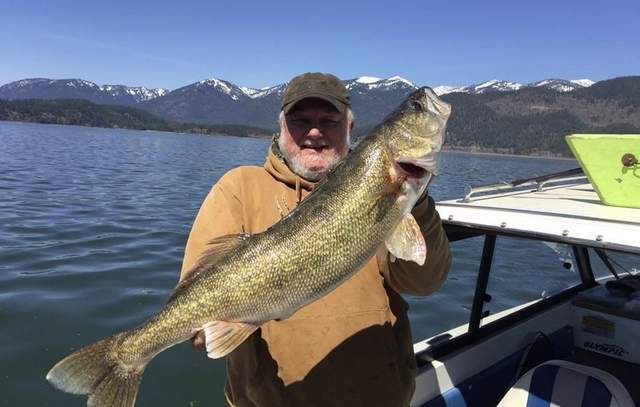 If you are planning on looking for trophy walleye outside of our home state and planning to venture into our neighboring states, Idaho’s Lake Pend Oreille is apparently not going to be the place to go if Idaho Fish & Game has their way, according to an article by Ralph Bartholdt in the CDA Press. At the behest of Fish and Game, 1,284 walleye were netted last spring and 1,233 were removed from the lake. The difference, 51 fish, were released as part of a tagging study, Andy Dux of Fish and Game said last week in a report. “Walleye, like lake trout, are a top level predator, and even though they are a popular sport fish that benefits fisheries elsewhere, they pose a significant risk to the Lake Pend Oreille fishery,” Dux said. So, how did the walleye get into to Lake Pend Oreille? The glass-eyed fish are reportedly flushed during high water years into Lake Pend Oreille from Cabinet Gorge Reservoir in Montana, where they were illegally introduced. Peamouth, whitefish, pikeminnow, bull and cutthroat trout were the norm. The size and increasing numbers of the walleye have taken IDFG fishery biologists by surprise, which resulted in the fish being gillnetted in the spring of 2018. The incidental catches from the gillnetting included “59 bull trout — 27 died, and 33 pike. All of them were removed. And 452 smallmouth bass were caught in the nets between Denton Slough and the Long Bridge. All of them were released.” Some people in the community believe Idaho Fish & Game is going too far, though. Fishing guide Chad Landrum of Sandpoint’s Go Fish Charters thinks the state fishery department overstepped its reach when it opted to kill a slew of walleye without consulting anglers. Or, at least allowing anglers a chance at the walleyes, which are sought throughout the continent as a highly palatable sport fish. “They are an amazing fishery resource and not shown to be detrimental to our fishery one iota,” Landrum said. According to Fish and Game, walleye eat kokanee, and having another predator eat away at the lake’s foundational food source may not be feasible. Apparently, there is a “smorgasboard” of fish at Lake Pend Oreille, in addition to walleye, these fish include German brown trout, pike, bass, bull trout, cutthroats, Gerrard rainbows (kamloops) and kokanne–which is referred to as the lake’s crop. There are more types of fish than that, but walleye are the issue at this point, and whether some people agree or not, Idaho Fish & Game wants them gone, according to this article. Read the full article by CDA Press’s Ralph Bartholdt here, and let us know your thoughts.